Oui oui oui... Luxury in Bed is AVAILABLE HERE !!! 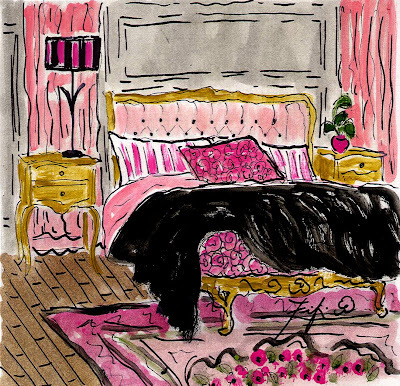 What this painting says to moi... an elegant bedroom to wake up in every morning... to greet the NEW day and be THRILLED to be able to REJOICE with my FAMILY and FRIENDS... a TRUE LUXURY!!! SPLENDEROSA's FABuLOUS By Invitation Only group!!! Lovely post...great painting..very inviting bed and perfect thoughts...have a lovely day. Yes lovely words and lovely painting. I want to curl right up in that bed and dream wonderful dreams. What a wonderful way to interpret that quote. Fun. Thank you. Wonderful painting and post. Thanks for participating. Fifi, we are so glad to have found your lovely blog and art work. What a wonderful work of art to represent a beautiful passage. Cheery & feminine, love the rendering! Thanks for visiting my blog..happy Sept! And - going to bed with a peaceful mind, waking up rested and greeting the new day - real luxury!